People often talk about over-excitable, ill-mannered horses, but what can you do with lazy or stubborn horses that can’t, or won’t, do as you want them to? Why are some horses ‘lazy’? There are several reasons why a horse might be sluggish and unresponsive, aside from just having a laid-back personality, and it is important to get to the root of the problem. First and foremost, consider if your horse might be unwell, as illness and injury will influence a horse’s desire to exercise and work. If you suspect a problem, especially if your horse’s personality changes rather suddenly, consult your vet to determine if there’s an underlying cause. Some horses are just naturally more easy-going than others. Draft horses, or ‘coldbloods’ are more laid-back than active, highly-strung ‘warmbloods’, which is partly why they have these names. While there are things you can do to encourage higher energy in more placid horses, ultimately, there is only so much pushing you can do as you can’t change the very nature of a horse. Sometimes, the rider is to blame for low energy and poor responsiveness. Lazy horses tend to be given to beginners to ride as they are considered more relaxed and mannered than high-energy horses, but often, this is because they have consistently been ridden by inexperience riders that have taught them to be lazy and desensitized them to the aids. If a rider hasn’t developed a good riding seat and has the wrong posture and positioning, it will seriously affect a horse’s responsiveness and willingness to work. If you’re finding you have to apply lots of leg pressure or use your crop to get your horse to go forward, this is probably a sign you’ve desensitised your horse. Desensitisation happens when cues aren’t clear and consistent. If a horse is unsure what you’re asking him to do, he will give up listening and responding. If there’s no chance of any of these being the cause and you’re certain your horse isn’t in pain from an injury or illness, it may be that you are simply over-working your horse and asking for too much, for too long. 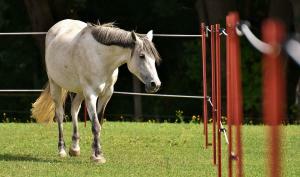 Give your horse a break or significantly reduce the workload until he starts responding again. If your horse isn't fit then this can result in him running out of steam and appearing lazy when he is in fact exhausted. Lazy horses are often overweight and are therefore usually on a restricted diet which can mean they may be lacking in important vitamins, minerals and amino acids, important in energy production. Have a thorough look over your horse, including a check of the feet, and make sure there is nothing obvious hindering his ability to exercise and work. If you believe your horse is desensitised to your aids then book some lessons with a good instructor who can help you to overcome this with training. Do a worm count. Sometimes a parasite burden is behind a horse’s lethargy and can hinder the body’s uptake of nutrients and energy from food. Think about what you’re feeding and if it’s providing enough energy. Introducing a supplement can help, such as a performance or energy-boosting formula. Science Supplements EnerGex can be used before, during or after exercise to help support energy delivery to the horse and is great in lethargic horses that need a helping hand. Is your horse getting enough fibre? Consider offering more hay and roughage. An absolute minimum of 1% of their bodyweight should be given a day. Sugar beet is also a great source of highly digestible fibre. Fairly often, riders will fail to feed sufficient electrolytes when their horses are in work, which results in deficiencies and imbalances. Start including one and see if you notice a difference. Increasing your horse's fitness can really help with providing more energy and there are many fitness plans available - speak to your instructor for advice. If your horse is on a restricted diet, ensure they get all the necessary vitamins and minerals with a general purpose supplement or a feed balancer. Finally, if you’ve explored all options, tried different solutions, and consulted your vet, and still your horse is sluggish and disinterested, it’s time to accept that maybe your horse’s temperament is just laid-back and low energy. Some horses are, and that does have its advantages, but if you desire to compete at a higher level then you might want to consider finding a new horse. If you have any advice of your own, please don’t hesitate to share it with us and our other readers! Could it possibley be that your horse is bored out of it's brains??? Routine is good BUT the same lunge patterns, same schooling, same hacks, same roads and lanes. Do something different for a change.